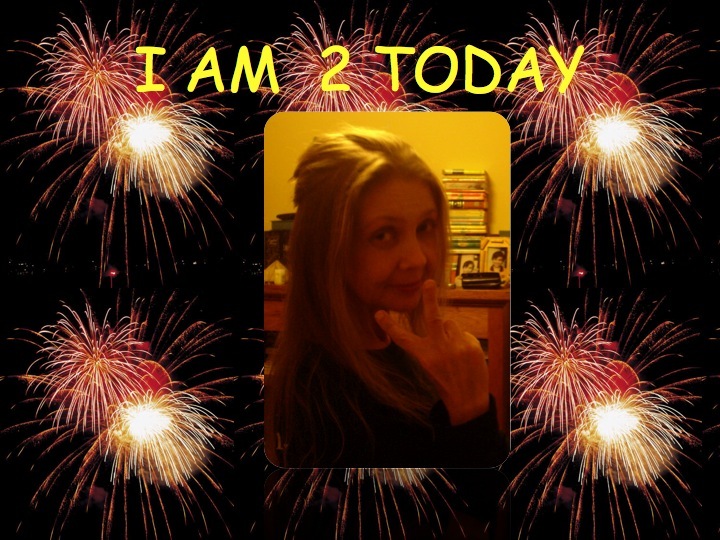 It’s my 2nd year Blogoversary today. When I first started blogging I didn’t think I would last this long. I have made it to two years due to all of my wonderful, amazing, fabulous readers – you have made blogging such a worthwhile experience for me. THANK YOU. THANK YOU. THANK YOU!!!!!!!!! I feel more confident as a writer since starting blogging and I have managed to work through many of life’s issues right here with your invaluable help. So let’s crack open the champagne and drink to the online blogging community who are more like friends than readers. And once again THANK YOU for all your support. Happy Blogiversary! (and, um, I thought it was funny that it looked like you were flipping the bird, but I knew what you really meant. I know I am only one of many who are very glad you’ve continued blogging. And really, Selma, I owe you a big thank you for your blog. Happy birthday to you…happy birthday to you..
(It’s probably good that you can’t hear me sing) . I have learned much from you. Am grateful for the connection. And now…..a chipmunk. Keep up the spectacularly intuitive, poignant, and witty writing! You’re the best, Selma!! Congratulations on 2 years and here’s to two more (or even more than that)!!! You have an amazing blog, you write so well, you have this ability to pull me right into your stories from the first sentence. Thank you for having such an amazing blog. To this day I am so happy to have stumbled upon your blog… your blog has helped me through some rough times this past year! Your stories would always put a smile on my face and they would make my vivid imagination go wild! On some really bad days your take on some stuff would make me laugh – I would go back and read the posts that I knew would put a smile on my face. I’m sure you have heard this plenty of times – you are an amazing person and I am happy to have you as a friend, your blog is amazing as are all your stories and life adventures!!! I’m so glad that you didn’t stop blogging! You had many of us worried there when you had taken a break LOL! Keep up the great work and I am still patiently waiting for you to publish your first book! Big hugs!!!!!! Are ytou sure about the bird? Haha, congratulations! Your writing is beautiful and your soul sings. I didn’t really look at the photo until just before I posted it and I thought: Good Lord! But I had to stick with it because my camera is about to die and it wouldn’t let me take another. I am glad I’ve stuck with blogging. As we all know it can sometimes be hard to find the time, but overall it is extremely rewarding and a great outlet for whatever is on our minds! And I owe you a big thank you for visiting me. I do love your true blue Aussie sense of humour! A song is always welcome. Thanks so much! Thanks are also due to you. I hope you continue to keep me posted on all the injustices going on in the world – I have learned a lot from you. It has been a pleasure getting to know you. Thanks for the chipmunk – I can’t wait to go and look! Thanks so much. It would be great if I could keep this going. There is still so much to write and talk about. It’s great fun! What a lovely thing to say. I feel the same way about you and I am in love with your photo blog. Such lovely, almost poignant images. That is a great tag line! ‘Because I breathe, I blog’ – I really like that. I really appreciate your comment and getting to know you. It has been an inspiration hearing your stories. I hope we both continue to blog for a long time to come. Hahaha. I would love to go through the terrible twos. I saw a little boy in the supermarket the other day having a tantrum. He was about 2. It looked incredibly exhilarating just to scream and wail like that. It must be great to get all your emotions out. But if I did it now I’d probably be locked up! And I love knowing you. Your sense of humour and warmth are such a breath of fresh air. I am so glad to have met you! Meeting you has been one of the highlights of blogging for me. To see you deal with and recover from cancer inspires me daily. I’m not sure I would have coped as well as you have. It’s amazing to think that you are all the way over in Canada and I am here and we can become friends. That’s the power of the internet! Hahaha. It has been great getting to know you. Your comments always make me smile. I am really grateful!!! Oh Happy 2nd Blogoversary my dear! Yours is one of the most pleasant blogs on the Internet. I feel like I’m sitting down for a coffee with a very eloquent friend when I pop over for a read. Also, I think something that really stands out on your blog is how you respond to every single comment and with such sincerity. You’re an inspiration sweet Selma 🙂 May your days of blogging be many, happy, and bear good fruit. Your words are beautiful and soothe the soul. Please don’t ever stop writing my little Aussie mate. Thanks so much for saying that. It really means a lot. I do like to respond to every comment. I am so grateful when people stop and say ‘Hi.’ I remember the days when no one left a comment and it was lonely out here. I enjoy blogging. It has given me a lot. It has also taught me a lot about myself. I never expected that to happen! Me and my suspicious hand gestures. It’s very naughty, indeed. If I can soothe a soul or two then I feel it’s all worth it. And if I can meet lovely people like you, then that is definitely the icing on the cake. You are a true friend! I’ll try not to stop. I really appreciate you stopping by. I know you’re strapped for time at the moment. Wouldn’t it be good if there was a poet in there somewhere? You never know…. Happy 2nd Blogoversary! I hope you continue for many more years. Before The Blog, I used to do short ‘postcards’ for Agora Publishing, and could do an article from two or three sort of pasted together, and the cracks filled in. Now, I do the same with blog posts. Happy Blogiversary sweety! Ive been reading you for as long as I can remember and I am looking forward to even MORE! Thanks so much. I often wonder how long I’ll keep going. It’ll be an interesting experiment! And me with you. I travel vicariously through you. And I do enjoy it! Awww, thank you. Smooches right back at ya! Blogging makes the world go round now (so they say), so I’d better make sure I stay on the blogging train! Yours is one of the first blogs I ever read. I am so pleased your still going strong. The blogosphere would be a lonely place without you! The pleasure has been ALL mine, Selma! Now let’s gorge on cake! Congrats Sel and may there be many more years to come. Im glad I met you via the blogs! I’m glad I met you too. It’s been a pleasure!